For years, when I spotted the Torrington Gopher Hole Museum sign as I drove between Edmonton and Calgary on the QE2, I always wondered the same thing. Who would want to go to a gopher hole museum? Eventually, someone let me in on the fact that the museum wasn’t exactly about gopher holes. 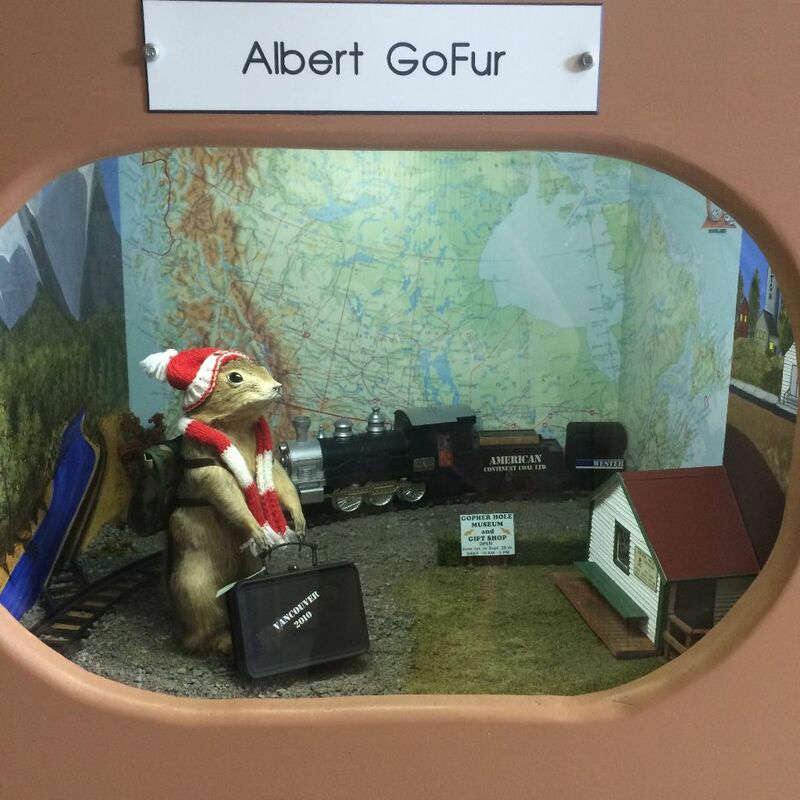 Instead – it was magical place where gophers are stuffed, dressed, and set into diorama displays (or holes) going about their daily activities. Thanks to google image I found some photos; I wanted to see it immediately. Unfortunately, I could never find the right time to go, or find a willing party on the drive back from Calgary to make the 30 km side trip. But ever since I started dating a foreigner, I’ve started to become a tourist in my own province. I often find myself checking out the Travel Alberta website. I was planning back in May when The Spaniard went to Drumheller, but the museum is only open from June 1 – September 30. Well, I am proud to say, I finally made it. I was planning on ‘surprising’ The Spaniard with a trip to Torrington on our way back from a recent weekend in southern Alberta, but when I mentioned I wanted to make a side trip on our way back to Edmonton, he wanted to know to where. I found the Gopher Hole Museum‘s website and showed him. His response was “what’s a gopher?” Obviously, this had me in hysterics. He was hesitant of course, especially when he figured out they weren’t hamsters, but he was willing to entertain my request. We were road-tripping in my car, so really he had no choice. Heading north on the QE2 we took the exit east to the quant hamlet of Torrington. We easily found the museum; we parked and I was almost skipping towards the entrance. Immediately we saw a map inviting visitors to mark their home. Sadly, someone from Santander Spain had already claimed The Spaniard’s home town on the giant map. We were greeted by the Dianne, the museum director, who gave us a brief history on the origins of the gopher hole museum. She explained that the town was looking for a reason to draw visitors. While most museums around the province have a historical significance, someone came up with the quirky idea of dressing up gophers into costumes. If something is strange enough, people might drive a few minutes off the highway to see it. Dianne explained that they thought they might get five years out of it, but here she was, 20 years later taking our money at the front door. At $2 a person, the price of admission is a bargain! Dianne explained that it had been a slow day, when we arrived one hour before closing only 85 people had darkened the door that Sunday. I thought 85 was decent, but apparently the gopher museum is a popular summer destination in Alberta. We learned that the original taxidermist had retired, and that another in the town had taken on the pivotal role of stuffing the gophers. The dioramas depicted scenes of the daily life at businesses and in community buildings around town, and that all of the backgrounds had been painted by a local artist. The anticipation was killing me and we finally entered the dimly lit room. Although I had seen glimpses of a few of the dioramas on the internet, I knew when I peered into the first box that it was worth the drive. Amazing. Absolutely amazing. Each gopher, elegantly dressed or displayed had me in awe, wonderment, or giggles. It was all so dramatic! There were romantic interludes. Some serious athletics happening at the local arena. And then there were some random out of town locations. All visitors are invited to select their favourite scene from the museum, and the top three from the previous year are listed on the door. He settled on the Old Tyme Music Jamboree as his favourite. I on the other hand had a much harder time deciding. As an Alberta girl, how could I not give my love and support for a gopher that could handle four horses in a chuck wagon race? In the end I settled for who I felt had the best accessory. The glasses on the gopher at Jesse James Coating had me in giggles immediately and he had to have my vote. We learned that the museum introduces new dioramas approximately every second year, and this little scene was the newest in their collection. But the fun didn’t stop there. We were invited to admire the mural on the outside of the museum. And I just had to get my photo with one of the town’s gopher-painted fire hydrants. The Spaniard flat our refused to pose in any more photos so Homer got to shine all by himself. Eventually we stumbled upon the Clem T. GoFur, a 12 foot high gopher statue located downtown Torrington. I had asked Dianne if there was anywhere in town to get ice cream and she steered me towards Pizza ‘n’ More. While their appeared to be no gas the day we were there, I did get a tasty cup of soft serve ice cream with reese pieces topping. Needless to say, I LOVED my visit to Torrington. For $2 and just 30 km off the highway, it is certainly worth the drive. It sort of felt like something out of a Wes Anderson film, but right in my own back yard. Explore Alberta – take a visit to Torrington, Alberta – home to the incredible Gopher Hole Museum.